While Plasma Cutting has become more prevalent in recent times due to its precision and cut quality, traditional Gas Cutting still has a place for various applications. Oxy-Fuel Cutting is still widely used for jobs which require a high degree of portability and manoeuvrability, particularly for cutting thicker steel. Both cutting processes have advantages and limitations, with the thickness of material, cut quality, location and cost just some things to consider when choosing a unit. To help you decide which process is right for you we’ve broken it down below to help you decide. With oxy-cutting, an oxygen/fuel gas flame preheats the steel to its ignition temperature. A high-powered oxygen jet is then directed at the metal, creating a chemical reaction between the oxygen and the metal to form iron oxide, also known as slag. The high-powered oxygen jet removes the slag from the kerf. When using oxy-cutting torches, cut quality, preheating times and metal thicknesses all may be influenced by the type of fuel gas used. There are four basic fuel gases used most frequently in combination with oxygen for this process: acetylene, propane, propylene and natural gas. What is Oxy-Cutting used for? Flame Cutting is highly effective on cutting thicker steel and other ferrous (Iron-based) materials. Many Oxy-fuel profile cutting systems have multi-purpose functionality which allow them to be used for other processes such as welding, brazing and soldering. The main benefit of the process is the lower up-front costs and the higher portability of the units in comparison to Plasma Cutters. It’s ability to cut thicker steel quickly and effectively is a major asset, while it is also versatile enough for a number of other applications. At a basic level, plasma cutting is a process that uses a high-velocity jet of ionized gas that is delivered from a constricting nozzle orifice. The high velocity ionized gas – the plasma – conducts electricity from the torch of the plasma cutter to the workpiece. The plasma heats the workpiece, melting the material. The high-velocity stream of ionized gas mechanically blows the molten metal away, severing the material. What is Plasma Cutting used for? Plasma cutting can be performed on any type of conductive metal – mild steel, aluminium and stainless are some examples. With mild steel, operators will experience faster, thicker cuts than with alloys. 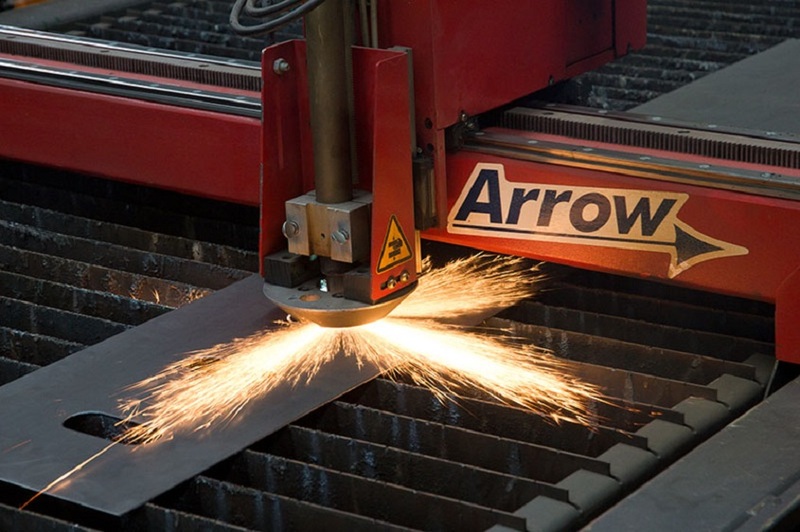 Plasma cutting is ideal for cutting steel, and non-ferrous material less than 1 inch thick. Plasma cutting really shines in some niche applications, such as cutting expanded metal, something that is nearly impossible with oxyfuel. And, compared to mechanical means of cutting, plasma cutting is typically much faster, and can easily make non-linear cuts. 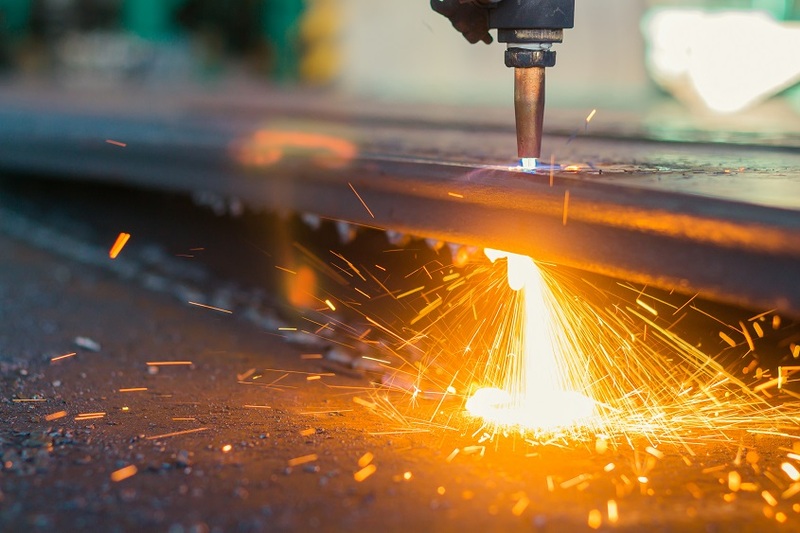 The benefits of plasma cutting include ease of use, higher quality cuts and faster travel speeds. Plasma cutting does not rely on oxidation to work and thus it can cut aluminium, stainless and any other conductive material. Ideal for repair and maintenance work or projects which require large cutting volumes. Still not sure of the best solution for your business? Why not give us a call to chat about the options that will suit both your process and budget? Supplying bespoke profile cutting systems is our speciality. This entry was posted in Customer Resources, Welding and Cutting Processes Information and tagged oxy-cutting, plasma cutting, profile cutting. Bookmark the permalink.